When scheduling snapshots in AppAssure there are a number of options that must be understood fully in order to ensure that the schedule will work properly and snapshots will be taken at the desired times. Backup window – The backup windows dictates the period of time in which a backup for that agent may be initiated. For example, if the backup window is set from 12 AM – 1 AM, then backups may be initiated for that agent starting at 12 AM but not after 1 AM. Hence there is a 1 hour period of the day where backups may run. Snapshot interval – The snapshot interval dictates the interval at which snapshots will be taken within the backup window. For example, if the backup window is 1 hour long and the snapshot interval is set to 1 hour, then only 1 snapshot will be initiated during the backup window. If the backup window is 1 hour long and the interval is set to 15 minutes, then as many as 4 backups may be initiated during the backup window. Maximum Concurrent Transfers - The maximum concurrent transfers setting specifies how many backups may be running at the same time. By default the value is set to 3, which limits the number of simultaneous backups to 3. 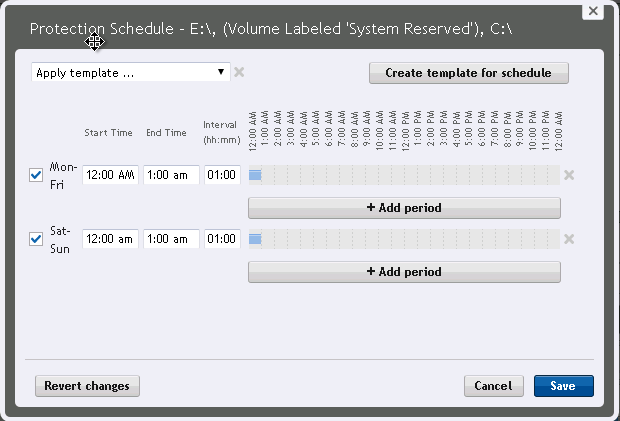 If the maximum number of backups allowed to run are already in process, the scheduler will wait until a backup slot becomes available before it will initiate the next backup. This means that it is possible for a backup not to be initiated because there is never an available slot during it's alloted backup window. This process may cause issues for customers who are running only 1 backup per day and have a large number of agents. For example, if the backup window for 20 agents is set to 1 hour (12 AM - 1 AM) and the interval is set to 1 hour that means that only 1 snapshot will be taken for each agent that day. However if the maximum concurrent transfers is set to 3 that means that only 3 backups will run at the same time. If the backups of the agents takes longer than 1 hour, there is a high likelihood that a number of agents will not backup because there is never a free backup slot during the backup window. To avoid this issue, ensure that the backup window is set long enough that all backups can complete within that time frame and that the interval is still the same length or longer than the backup window (otherwise more than one backup will be taken).